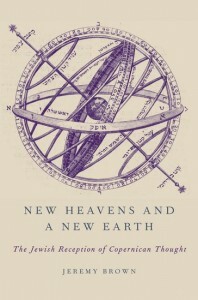 Published in 2013, New Heavens and a New Earth: The Jewish Reception of Copernican Thought, by Jeremy Brown (Oxford University Press) is described as the “first comprehensive examination of the Jewish reception of Copernican thought,” spanning four centuries of Jewish commentary on the Copernican model. In his research, Brown also demonstrates the ways in which religions tend to evolve to make room for new scientific findings, however threatening they may have initially appeared to be. If any of my readers happen to pick this up, I’d welcome your comments here. Happy new year to all!